This weekend you are invited to join in the Sunday Social after the 11am Mass. Join us in the Loveley Room for refreshments. Are you interested ion helping out the Hospitality Committe Learn more here. Yes, this weekend is Superbowl Sunday and yes we will have the 7:30pm Mass. Stations of the Cross during Lent will be held each Friday, stay tuned for further details. It’s February, and winter’s cruel grip is upon us. We handed over the church this week to Pope Francis Center volunteers and staff to provide overnight shelter to the homeless; with edifying commitment and competence they stayed open 24 hrs/day Tuesday-Friday. We are blessed to be part of such great love in action. February also means Spring is only six weeks away! But we still have much to engage our hearts and minds this month. Next week is the last opportunity to register for the Jesuit Alumni and Friends Winter Luncheon featuring Dr. Ike McKinnon, a long-time friend of the Jesuits here in Detroit. See details below. To celebrate St. Valentine we’ll have a special blessing for our singles as well as our couples. The Church has designated Feb. 8, the feast day of recent African saint Sr. Josephine Bakhita, as an annual day of prayer and awareness against human trafficking, of which she herself was a victim. February is African American History Month – let’s spend it learning about Catholic African American history. I have taken the time to compile a number of links here, and I invite you to save this email so you can come back to it all month until you’ve read all the links, especially those about the saint-candidates below. I challenge all of us as a parish to undertake some serious reading and reflection as one small way to combat racism, by growing in appreciation of the heroic yet often-unknown contributions of African Americans to the life of the U.S. Catholic Church. Thea Bowman, Pierre Toussaint, Mary Elizabeth Lange, Augustus Tolton, Henriette Delille, Julia Greeley. “Welcome to Michigan!” people keep telling me when I complain about the cold. In October, I left a balmy 90-degree New York only to arrive to freezing temperatures here. It didn’t seem so welcoming. It seemed an awful lot like Michigan was giving me the cold shoulder. This latest nationwide cold snap – from deadly temperatures in Minnesota to snow in Florida – has warmed a lot of hearts, though. I read about a fancy restaurant in Chicago that offered soup, coffee, and a warm place to stay for those on the street. 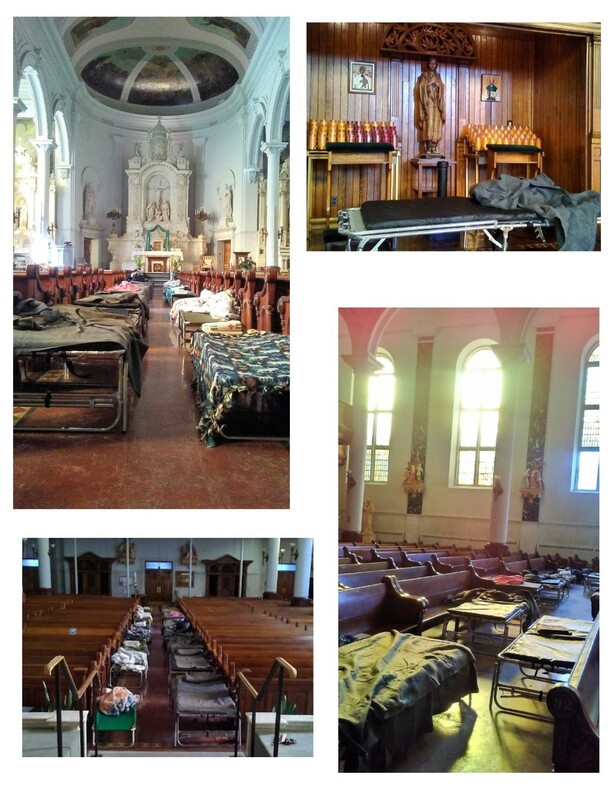 The Pope Francis Center has been running 24 hours this week and we, like many other churches across the country, have transformed the nave into a dormitory. I’ve fielded calls from concerned citizens wondering how they could help the man or woman they see near their office every day. Maybe we aren’t all quite as invisible to one another as we sometimes think. It is also heartening to know that people will turn to us for help or advice, because as church, this is our job: to take care of one another, and to help each other be our kindest, most compassionate selves. This past week, our young adults worked at the food bank, our social justice committee met to discern how to serve our city’s most vulnerable, and parishioners answered the call to volunteer to help our Pope Francis Center’s guests through this state of emergency. I can feel it, can you? I think we are experiencing a thaw. Thank you to everyone who participated in our service event at Gleaners. Your contribution has helped shelters and kitchens across the area meet this week’s state of emergency. Well done! Please join us on Wednesdays at 6:30 for our weekly scripture reflection. We will meet in the parish offices to discuss and reflect on the week’s readings. We have two upcoming socials this month. We will be celebrating Valentine’s Day at our Second Sunday Social on February 10 after the 7:30 p.m. mass, and will be gathering at Checker Bar (124 Cadillac Square) for happy hour on February 21 beginning at 5:30. Our month’s service event will be on February 16. We will be doing some light work around the parish and Pope Francis Center from 10:30 to 2:00. Lunch will be served. Housing people continuously during the day and night is not easy. For more than 25 years this community has answered the call to care for the marginalized and this week we pulled together and made what seemed impossible happen. More than 60 people were not only kept warm, they were lovingly cared for with homemade blankets, delicious food and companionship. This act of love has moved me so deeply. Seeing the pews where so many have worshipped and prayed for generations surrounded by cots, blankets and personal belongings is a reminder of what we are all called to do for one another. Here we are on the other side of a polar vortex and as I have witnessed several times, God has provided all that was required to care for His children. Time and time again, there has been a need that seemed just out of reach. Then, in walks the person with the just the skills we were looking for or the check written for just the right amount arrives in the mail; sometimes both! As I reflect on the teamwork; parish and center, volunteers and staff, community and civic groups, donors and prayer warriors; I’m taught that this work of sharing God's love with others is the Liturgy. We are the hands and feet, the smiles and hugs, the loving, caring presence of Christ we experience during Mass. Without us God couldn’t complete His work; on earth as it is in heaven. This week has been nothing short of miraculous. Thank you for your contributions to this effort in caring for God's children. Don’t wait to register for the Jesuit Alumni and Friends luncheon coming up on Wednesday, February 13. 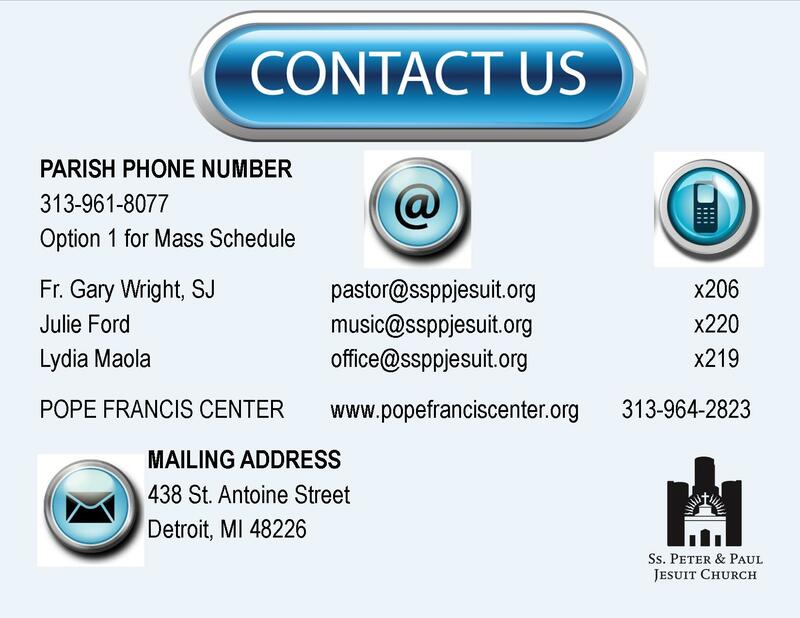 Faith in a Violent Society: An Ignatian Perspective from a Local Guy will be presented by Dr. Isaiah "Ike" McKinnon, former chief of police and deputy mayor, a long-time friend of the Jesuits here in Detroit and a professor at our University. The event will be held at the Detroit Athletic Club. Click here to make reservations. Save the dates! – March 3-5, 2019. We will be collaborating with Gesu Church, our sister Jesuit parish, to kick off the Lenten season of spiritual renewal with a three-day series of presentations by Jesuit Fr. Matt Linn. Fr. Linn and his team are internationally-known speakers, having given retreats and conferences in over 60 countries and authored 24 books. The sessions will take place at Gesu Church, on Sunday afternoon, March 3, and on Monday and Tuesday evenings, concluding with a Mardi Gras celebration after the closing session. Exact times have not yet been set. Fr. Linn has entitled his series “Becoming Fully Alive by Healing Our Hurts.” He writes, “Whether it is physical pain, hurts from the past or the present difficult situation, we carry hurts that drain life, leaving us half-alive.” His presentations will demonstrate how we can pray in ways that heal our hurts, so that we can become fully alive and healers of our world.